Georgia Doctor Appointed Head Of The CDC : Shots - Health News Dr. Brenda Fitzgerald, who leads the Georgia Department of Public Health, has been appointed CDC director. She'll take over as the Trump administration seeks big cuts to the CDC's budget. 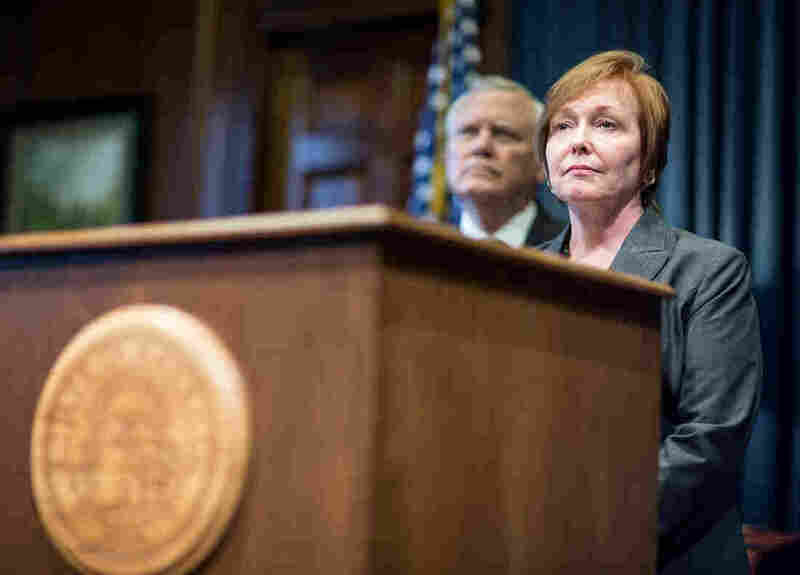 Dr. Brenda Fitzgerald spoke in 2014 at a news conference on Georgia's preparations to deal with potential outbreaks of Ebola virus. "Having known Dr. Fitzgerald for many years, I know that she has a deep appreciation and understanding of medicine, public health, policy and leadership — all qualities that will prove vital as she leads the CDC in its work to protect America's health 24/7," HHS Secretary Tom Price said in a statement. She'll do so at a time when the agency's budget is under threat. The Trump administration has proposed cutting the CDC budget by $1.2 billion, which amounts to a 17 percent cut. As we've reported, that would include a $186 million cut to programs at the CDC's center on HIV/AIDS, hepatitis and other sexually transmitted diseases. The CDC's chronic disease prevention programs, such as those for diabetes, heart disease, stroke and obesity, would be cut by $222 million. At the time the budget was announced, Fitzgerald's predecessor Tom Frieden responded on Twitter, describing the proposed cuts as "unsafe at any level of enactment. Would increase illness, death, risk to Americans, and health care costs." On Twitter on Friday, Frieden noted Fitzgerald's experience as a state health commissioner. "Listening to & supporting CDC staff, she can succeed," he wrote. As health commissioner in Georgia, she oversaw efforts to prevent the spread of the Zika virus and coordinated the state's response to Ebola. She spoke often about early childhood development and tackling childhood obesity, and advocated for the vaccination of babies and children to prevent disease. In 2014, she noted her role as a mother in an op-ed she wrote in the Atlanta Journal-Constitution titled "Babies need their vaccines." "As a board-certified obstetrician-gynecologist, I have seen the devastating and painful effects of whooping cough and other vaccine-preventable diseases," she wrote in the column. "Get vaccinated. Help spread the truth on vaccines, not the diseases they prevent."